Tree roots in Your Sewer Line ? Tree roots are very common in residential and commercial sewer lines. Most people don’t have a clue and ask all the time, how do I know if I have tree roots in my sewer line until the sewer backs up and the home is ready to flood. Years ago, if you had a clogged Sewer, the only way to know if you had tree roots in your sewer line is for plumbers to dig up the pipe itself to inspect it and know the cause of the blockage. Today however, with modern technology used by most professional Scottsdale Plumbing Service companies. This equipment allows us to find out what’s wrong with your pipes without doing any excavation or damage to your hard or soft scape. We use a high tech Sewer drain camera to locate the location and the depth of your problem, If you call our Plumber in Scottsdale, we’re able to see exactly what is causing your clog and see if you have tree roots in your sewer line on the television screen. How to Remove Tree Roots in your Sewer Line. 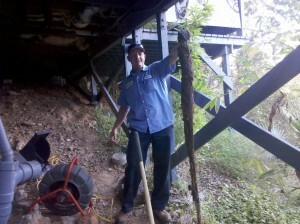 The way most Scottsdale Drain Cleaning companies remove tree roots in your sewer line is by way of a sewer snake. The sewer snake has a cutting blade on the tip and when the blade arrives at the tree root intrusion, it will cut and rip the roots and wrap around the cable and retrieve the roots from the main sewer. Using this method will not remove all the tree roots from the line but will remove most of them. The only way to completely remove all the tree roots in your sewer line is with a large piece of equipment called a hydro-jetter or you can treat the tree roots with a chemical and kill the tree roots. The hydro-jetter will remove all the tree roots in your sewer line by way of using high pressure water that comes out of the machine like a water laser and cuts the tree roots at the point of entry. The only chemical we use is a product called Rootx, this is a foaming root killer that will attack the tree roots that are entering from the top of the pipe. Most root killing chemicals do not touch the tree roots on the top and only get to the tree roots on the bottom and the sides. if you replace the sewer, we will have to get a permit from the City of Scottsdale and get an inspection for your protection when we remove tree roots in your sewer line. Will tree roots break the sewer line? The answer is yes, tree roots will break the sewer line and at some point will collapse the pipe when tree roots in your sewer line have gotten mature. It’s hard for most people to imagine a tree root breaking a sewer line, but one of the biggest problems we find with clogged or broken sewer lines has to do with tree roots in the sewer. Many homeowners in Scottsdale have experienced damage to their sewer line caused by tree roots and often ask, how tree roots entered the sewer line if it is all one pipe and its five feet deep underground. The problem is that most sewer lines are made of clay or some sort of material the is not 100% sealed, and not completely enclosed and will develop cracks, slips or breakages that allow tree roots to find their way in. Once the tree roots enter the sewer line, it’s all about removing them as soon as possible to avoid larger problems in the future. Removing tree roots in your sewer line can be a very important step in maintaining your sewer line and keeping from total collapse later on down the road. When a home is being built nowadays, the builders installing the Sewer use plastic ABS pipes for sewer lines, which is impervious to most tree root damage and doesn’t degrade and break as easily. But in the past, it was a common practice to use clay pipe to construct sewer drains, If your home was built before the early 80s, most likely your sewer line is made of clay and will need attention from time to time. Most likely you have tree roots in your sewer line. Options for removing tree roots in your sewer line. Unlike ABS, most will call it PVC, they were only meant to last a few decades. Unlike today’s ABS sewer pipe. These inferior sewer pipes are failing at an increasing rate in the Phoenix-Scottsdale AZ area. When that happens, it is very rare that a Scottsdale plumber can restore the sewer line to your home without replacing it. If we catch it in time, We have other methods of replacing the sewer line without destruction to your property with a process called CIPP also known as Cured In Place Pipe, Trench-less pipe replacement. This is by far the cleanest way to repair or replace a sewer line and not destroy the landscaping,sidewalks, and driveways around your home. The process goes like this, We clean the line with a hydro-jetter to remove all the tree roots and debris from the line and then we use the trench-less method to repair. Call for a free estimate on Tree Root Removal or replacing your sewer line in Scottsdale. tree roots in your sewer line can cost tons of money in the long run. tree roots in your sewer line will cause damage to the pipe if not maintained. tree roots in your sewer line can be removed if caught early. tree roots in your sewer line can be removed with a hydro-jetter. tree roots in your sewer line will collapse the pipe at some point. Don’t wait, Get the tree roots in your sewer line remover today. This person losuhd be arrested! He’s advocating the death of an innocent guy who was just minding his own business when Obama walked down his street. Apparently Obama can’t handle tough questions from regular people without his media buddies parsing everything. Since then they’ve used Ohio government resources to investigate Joe in 24 hours, more than Obama has been investigated by the media in 2 years. Then this idiot calls for his death. I’ve had it with these people! Obama is an aspiring dictator who wants to create his own Civilian National Security Force (from July 2nd Colorado speech) as strong, as powerful and as well funded as the real military! If these people are coming after us, just maybe we losuhd come for guys like this libtalker first!